In a large skillet, melt the duck fat over medium heat. Sauté the potatoes for 5 to 7 minutes, until they are nicely browned. Add the red onions to the skillet and continue cooking for 2 to 3 minutes, stirring occasionally. Add salt and pepper. Pour the potato mixture onto a baking tray large enough to hold the duck legs without overlapping. Bake in the oven for 15 to 20 minutes, turning occasionally. In a bowl, whisk together the maple syrup, vinegar and olive oil. Add the plums to the bowl and stir to coat with sauce. 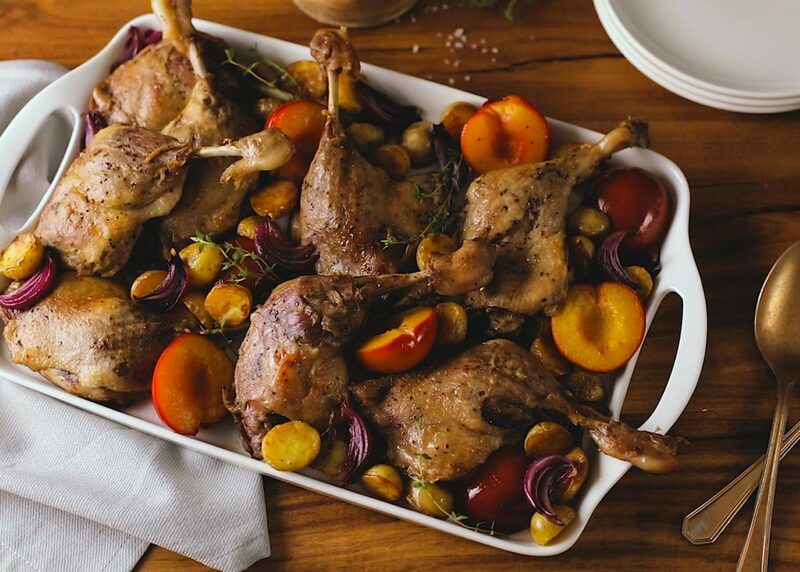 Add the plums and duck legs to the baking sheet, without overlapping the legs. Pour the sauce in the bowl over the duck legs. Continue baking for 15 to 20 minutes. 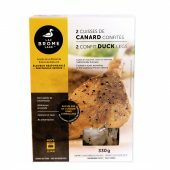 Set the oven to “broil” and broil and for 2 to 3 minutes, until the skin of the duck legs is golden and crispy.